Peace Corps Online: August 3, 2004: Headlines: COS - Swaziland: Television: Journalism: Village Voice: You could tell Matthews really dug being at the convention—gassing on about JFK and LBJ, comparing Teresa Heinz Kerry to Anouk Aimée and Jeanne Moreau, and (sheer ecstasy, this) being able to cut off his more vaunted NBC archrival, Tim Russert, marooned up in a FleetCenter skybox. Take that, Little Russ. August 3, 2004: Headlines: COS - Swaziland: Television: Journalism: Village Voice: You could tell Matthews really dug being at the convention—gassing on about JFK and LBJ, comparing Teresa Heinz Kerry to Anouk Aimée and Jeanne Moreau, and (sheer ecstasy, this) being able to cut off his more vaunted NBC archrival, Tim Russert, marooned up in a FleetCenter skybox. Take that, Little Russ. Peace Corps Online: Directory: Swaziland: Special Report: RPCV Journalist Chris Matthews: Chris Matthews: Archived Stories: August 3, 2004: Headlines: COS - Swaziland: Television: Journalism: Village Voice: You could tell Matthews really dug being at the convention—gassing on about JFK and LBJ, comparing Teresa Heinz Kerry to Anouk Aimée and Jeanne Moreau, and (sheer ecstasy, this) being able to cut off his more vaunted NBC archrival, Tim Russert, marooned up in a FleetCenter skybox. Take that, Little Russ. You could tell Matthews really dug being at the convention—gassing on about JFK and LBJ, comparing Teresa Heinz Kerry to Anouk Aimée and Jeanne Moreau, and (sheer ecstasy, this) being able to cut off his more vaunted NBC archrival, Tim Russert, marooned up in a FleetCenter skybox. Take that, Little Russ. The bitterest sniping in Boston last week involved no politicians. It was a catfight among the members of CNN's Capital Gang. The worst offender was hardballer Chris Matthews. 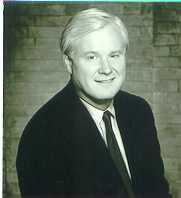 I'm sorry to say this, for I once spent time with Matthews and liked him enormously; moreover, his MSNBC coverage of the convention was by miles the liveliest. He spent countless hours in a media pigpen outside Fanueil Hall with a panel including NBC's Andrea Mitchell, Newsweek's Howard Fineman, and creepy-crawly Joe Scarborough (who, with a few more millennia of hard work, might just evolve into a mammal). You could tell Matthews really dug being at the convention—gassing on about JFK and LBJ, comparing Teresa Heinz Kerry to Anouk Aimée and Jeanne Moreau, and (sheer ecstasy, this) being able to cut off his more vaunted NBC archrival, Tim Russert, marooned up in a FleetCenter skybox. Take that, Little Russ.